The 'Caerhays Belle' in my garden is approaching thirty years old. The little stick which came in the mail back then from Gossler Farms Nursery was my tiny share of a now famed heritage. 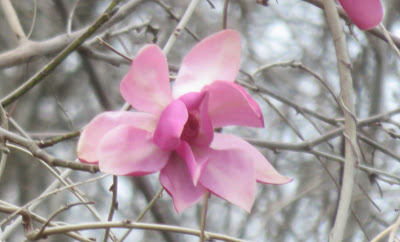 The parentage is usually given as Magnolia sargentiana var. robusta and Magnolia sprengeri var. diva. It's blooming here this year for the first time - that's a long time to wait, but if nothing else, gardening teaches us patience, doesn't it? Let's hope the diva is expressed as diva in Joan Sutherland (rarely cancels, glorious in full bloom) and not as in Maria Callas (Madame Callas will not be receiving the public today...). It's hard to photograph the blooms of this plant because they are about 50' from where the photographer will be standing. The smallest jiggle of the camera (set near its maximum telescopic range) throws the field off. I've also used Wayne's birding telescope to get a good look. Of the three images, the lowest one (the one not quite in focus) is one I took this morning. The upper ones were taken a bit later today by Wayne - they are crisply in focus. The color is hard to describe, and seems to vary throughout the day. Sometimes it's the bright pink you see in the lowest of the attached images. Sometimes it's a much darker dried-blood red. And sometimes it matches exactly the cardinals (birds) in the garden. How exactly? Although there is no shortage of roosting spots in this garden, twice I've seen male cardinals approach the developing buds and land next to them as if checking out the new competition. 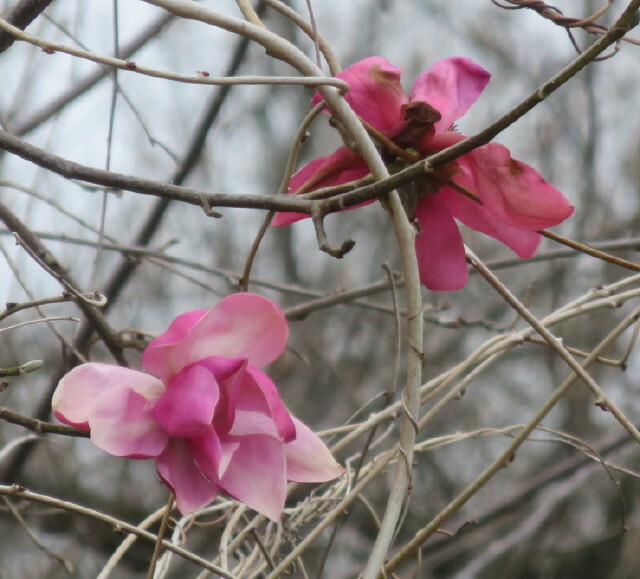 The first time I saw this, I thought I was looking at two magnolia buds - until one of them moved and flew away! I'll try to get more pictures later which show the beautifully contrasting red stamens. The Diva's daughter is quite the eye full, isn't she? Is this a new pest so far unaddressed by the USDA? It seems that March this year came in not as a lamb, not as a lion, not, as expected last night, as a snow leopard, but rather to the strains of a Rossini opera, La gazza ladra. The buds on the willows are swelling, the birds are singing more, the hellebores, witch hazels, winter aconites, tommies, winter jasmine and snowdrops are blooming. But, not all the signs of spring are welcome! Much as I enjoy the daily increase in birdsong at this time of year, one of the ‘’avian” visitors was definitely in the non grata category: La gazza ladra has made a visit, drawn from its lair by the blooming of the snowdrops. While checking out the hellebores and witch hazels at the back of the garden yesterday, I had a disturbing surprise: the garden was the scene of snowdrop theft recently. Right in the middle of a wide band of long-established snowdrops there is a bare space about eighteen inches long and the width of a square-tipped shovel. Scattered nearby are some separated leaves and debris. Although this ugly event puts me in some distinguished company, I would gladly have declined membership in this group! My garden is full of plants acquired fairly from friends: these remind me of those friendships long after the friends have moved on or the friends themselves have passed. When I have garden visitors, I sometimes identify these plants by the names of their donors. Some of you reading this are remembered in this way. Please do me a favor: if, when visiting other gardens, the garden owner should slip and identify some snowdrops as "the snowdrops I purloined from Jim", please keep it to yourself - I don't want to know this about someone. For those of you not into Rossini, La gazza ladra means "The thieving magpie". But of course it was not a magpie which did the deed: it was Homo sapiens galanthokleptistatus, a vile, feculent creature which seems to be on the increase. A magazine to which I am subscribed ran an article on the times when different species of birds in central Europe begin singing each morning. I’ve never seen data like that for our local birds. For years I’ve been recording now and then the early morning bird choruses, so I’ve got some raw material of my own which might be useful in working out something like that for my backyard birds. Even with recordings it won’t be easy because in addition to the their widely recognized songs, birds produce other less readily recognized sounds. Right now I’m focused on the calls of one particular species of bird, the local crow. The local crows have had roosts nearby for at least a half century. Human construction development has caused them to move several times, but they seem to have remained in the same general area. The enormous crow flocks we had before West Nile disease nearly eliminated the local crows, jays and starlings are a thing of the past. There was a time when hundreds, maybe thousands, of crows gathered late every day in the woods in back of the house before they flew off en masse to their roost. And once the crows were gone, the patient, knowledgeable bird watcher can wait for the next act: with the crows gone, any accipiters lurking in the woods launch themselves off to their roost. Although the local crow population is currently small, they are still noisy. And that noise is what interests me now. About a month ago I began to notice that the crows were arriving in our neighborhood at about 7:30 A.M. As time passed, they arrived a bit earlier. Right now, they are arriving just a bit past 7 A.M. I’ve written “arriving” but actually what I’m noticing is the time I hear them for the first time. For all I know they have been sitting out there in the trees earlier than that. What’s certain is that those first morning crow noises are getting earlier and earlier. Sunrise now is not until 7:27 A.M., so they obviously are not waiting for the sun to rise. And after a brief arrival chat, they quiet down and I don't hear them. By the way, when I hear these early morning crows, I'm still deeply snuggled down into my cocoon in bed. I guess they know the truth in the old adage “the early bird catches the worm”! Maybe, but I don't want to be the early outdoor bird watcher who catches pneumonia! If you read this post before today, January 8, 2019, you read an earlier, somewhat truncated version. After reading that version, Wayne suggested a number of additions and other changes. Those have been woven in below. Most of us accumulate a lot of stuff during our lifetimes; but I'll bet that few of us leave behind any sort of documentation to help others give significance (other than monetary) to those things. 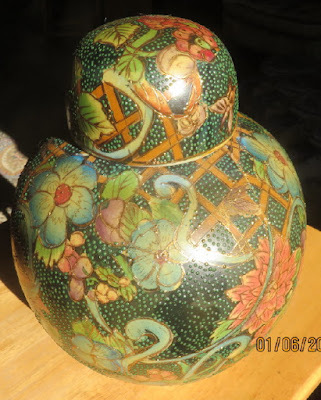 Here's the story behind the Chinese ginger jar in the image above. I doubt that it's worth anything on the market, so its significance is not one of dollars and cents; but it's a tangible reminder of a neat day trip Wayne and I experienced one August day a few years ago. 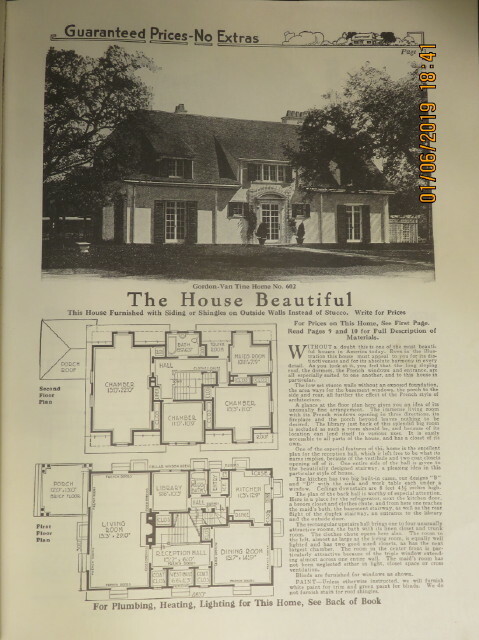 During the 20s and 30s of the last century magazines sometimes contained advertisements placed by lumber companies selling house kits. One example caught my eye long ago, and when I later purchased a Dover book on 20s house designs (see the image above), I found that very house described. Judge of my surprise (has anyone else used this phrase since pre-WWII times?) when a Google search turned up a surviving example about two hours away in western Virginia. It was in a small town just east of I-81, one we pass every time we visit Wayne's mom. We had attended a family reunion held earlier in the day in the Luray, Virginia area. When we left the reunion, we headed west, with the massive Massanutten Range spread out before us. And we could see a storm roiling and churning the valley sky on the other side of the range. When we eventually got onto Route 11 beyond Massanutten, we saw plenty of evidence of what that storm must have been like for people living there. Evidently it was yard sale day in that part of the valley. Here and there along Route 11 we began to see the havoc caused by that powerful wind storm: items for the prospective yard sales were scattered over lawns and adjacent fields. By then it was late in the day and getting dark, and people were scurrying about picking up the pieces. That storm did us a favor: I didn't have contact information about the current owners, so we just took a chance and drove by. The goal was simply to get a close look at the house, maybe even knock on the door and have a chat with the people living there now. As we approached the house, we could see activity in the driveway. We lucked out: the occupants were home and were out on the driveway picking up the pieces of their part of the yard sale. So we went up and introduced ourselves, told them why we were interested in the house, and then discovered that they evidently knew little about the history of the house. They had no idea that nearly a century ago magazine readers would have seen that very model pictured in several publications. 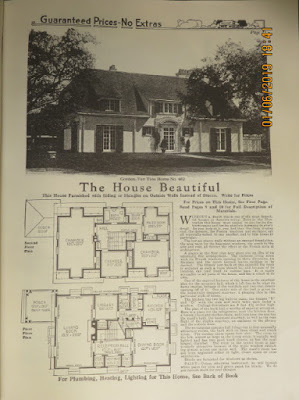 Those magazine photos even had a name for the house: "The House Beautiful". When we showed them the photo of "their" house in the Dover book, it created a stir. It should have: the editors of that Dover book chose an image of that model for the front cover of their book. 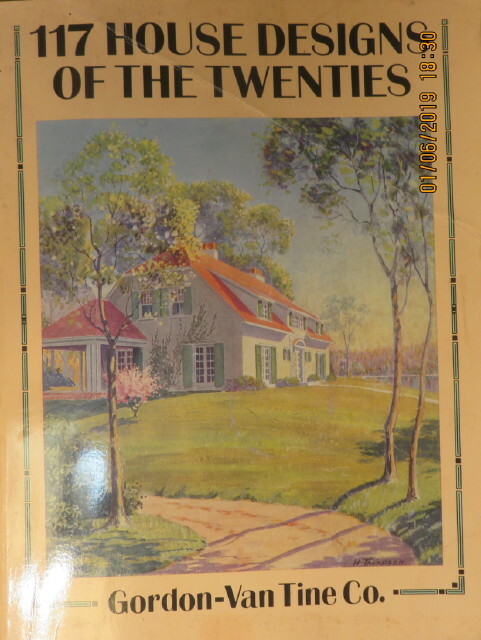 The book itself is a reprint of a house kit catalog originally published in 1923. Something gave me the impression that the current occupants did not own the house - maybe they were renters? And they were not prepared to have visitors inside the house. We did learn that the house had originally been built for a doctor, and he made certain changes to the basic design. These included changes to the interior floor plans and the election of an exterior other than stucco. When we saw it, the exterior had been painted with a disagreeably glossy white paint which produced a plastic-like effect on the faux block siding. I really like stucco, and I've seen houses on the east side of the National Zoo, houses probably built a century or so ago, with stucco in good shape. I'm still hoping that a future Google search will turn up another existing example of my dream house, one in better condition and in particular one with a stucco exterior. In the meantime, I have that Chinese ginger jar, selected from the detritus on my dream house's driveway, to remind me to continue the search. Because so many of them are found in houses, spiders of the family Pholcidae are among the most frequently encountered spiders. Although I’ve known this spider all of my adult life (it’s common in bathrooms and is widely called the cellar spider), thanks to Wikipedia I recently learned something fascinating and entertaining about it. 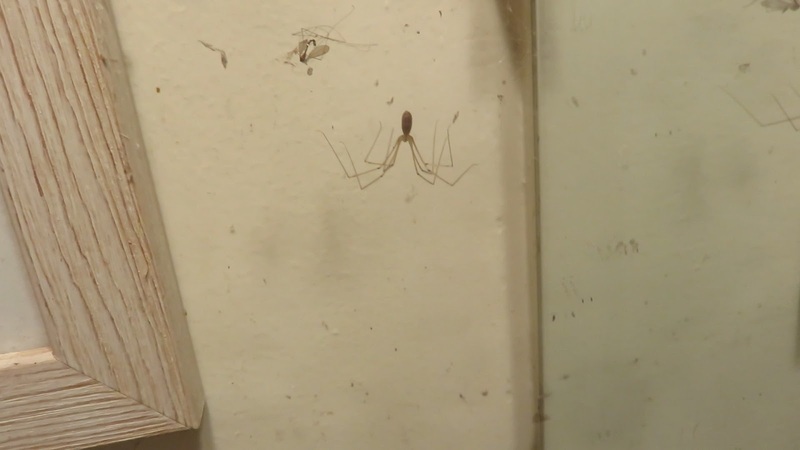 These spiders have a messy web with no apparent pattern. Usually you’ll see them waiting near the center of the disorganized mass of web. But watch the video above to see what happens when they are disturbed. This one is in the home bathroom. When I was a kid I was intrigued by the popularity of certain flowering house plants which in northern Europe seemed to be hugely popular but which always seemed to die quickly for me. The Persian cyclamen is a good example: when I first tried them long ago they lasted about a week before they collapsed. The begonias of the hiemalis hybrid group are another. Back in those days I had trouble keeping these going for long, too. Now that I'm on a retirement income and looking for ways to economize, and now that I realize that heating an entire house twenty-four hours per day for one person is a huge waste of resources, I keep the house much cooler than most of you are probably used to. It took a while to get used to this, and my resolve was boosted by reading in Gilbert White's late eighteenth- century The Natural History of Selbourne of the mornings when the water kept under his bed sometimes froze on really cold nights. There have been some rewards to my seeming austerity. I've discovered that those Persian cyclamen from the florist thrive under these chilly conditions. So long as I keep them watered they continue to bloom for months. 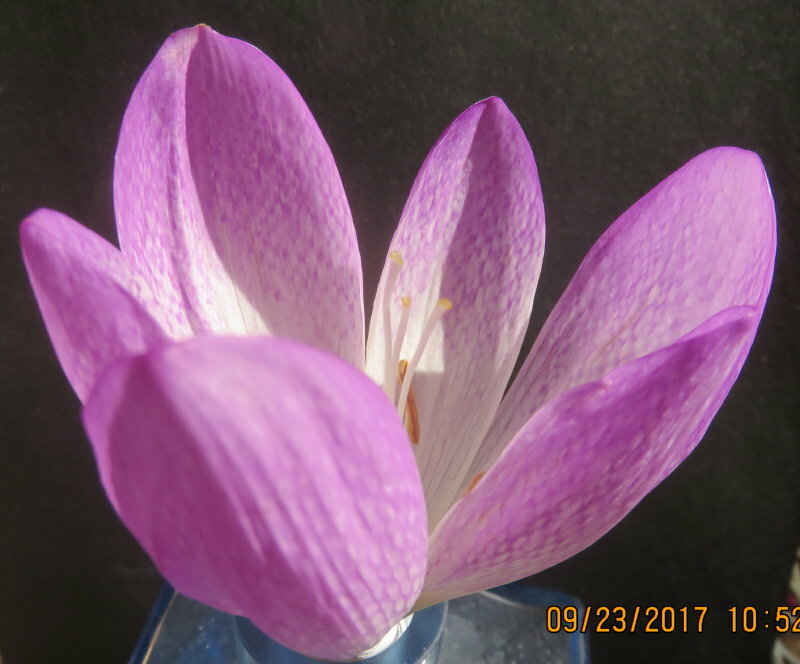 I've been careful to select the ones with good fragrance: the typical huge Persian cyclamens of the florists are either not scented or ill scented. The smaller sorts, closer to the wild Cyclamen persicum, sometimes have a great scent - like the fragrance of the beautician's cold cream. A hiemalis begonia on trial this year (the lowest of the three images above) just gets better and better (i.e. more floriferous) week after week. It shows no sign of slowing down. Right now my favorite florist flower of the season is the stock, Matthiola incana (these are probably hybrids of several Matthiola species). That's what you see in the two upper images above. The individual flowers are an inch and a half across and remind me of the blooms of Prunus mume. They are very pretty, and five stems make a handsome display. The ones in the image were purchased a week ago and still look fresh. But I've neglected to mention their best quality: the blooms have a wonderful clove scent, a scent free on the air and capable of filling the air in a still room. I've never seen these in a local garden, nor have I ever heard anyone speak of them as garden plants. Old books suggest that they are typical burn-out annuals which do not tolerate high temperatures. In the parts of England and Europe where cold summers (by eastern American standards) are the rule, they have been garden essentials for centuries. I've seen early twentieth-century German seed lists which catalog a prodigious number of varieties, few of which probably survive. Here's something interesting for those of you who like words: you probably know the botanical name Leucojum used for a group of early blooming amaryllis family plants. That name is derived from the old Greek words for "white" and "violet". The modern German word for stocks is Levkoje (say lef-ko-yer, where the italicized r is not fully pronounced). It looks a lot like Leucojum, doesn't it? As it turns out, the German word is also based on the old Greek words for "white" and "violet". I'm not sure when this word became standard in modern German; a quick look in the mid-sixteenth century herbal of Fuchs does not seem to use this word. The only stock I've grown in the garden is the related night-scented stock, Matthiola longipetala (long known as M. bicornis). This is one of those annuals which one sows by scattering the seed in late winter or earliest spring. The resulting plants are nothing to look at, but when they begin to bloom on late spring or early summer evenings, they can stop garden visitors in their tracks - that's how powerful the delightful scent is. This used to be a garden essential, but I get the impression that few gardeners now even seem to know about it. There are other intensely fragrant crucifers which have similar fragrances. The dame's violet, Hesperis matronalis, is one of them. Once a garden favorite, it's apt to be given weed status now, but that amazing fragrance earns it a place somewhere in many gardens. Years ago, I tried to puzzle out the Russian name for a lily ( an obscure early twentieth- century hybrid raised by Russia's Luther Burbank, Ivan Vladimirovich Michurin, Иван Владимирович Мичурин). The lily name was Romanized as "Fialkovaya" . The "Fialko-" part of the name is the Russian word for violet, фиалка. A bad translation of the name is "orchid lily" as if the lily were named for the color orchid. 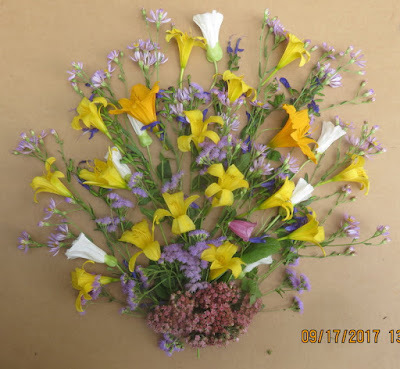 But the lily was really named for its scent, and while it might have been named for violet in the sense of sweet violet or Parma violet, I have a hunch it was named for the scent of Hesperis, a scent often likened to that of sweet violet. One modern Russian name for Hesperis matronalis is ночна́я фиа́лка (night violet), but a good Google search turns up other translations with a vaguely suggestive sense ( such as "mattress party violet" !). I really didn't do this, but I was so tempted. Back in July, I was diagnosed with diabetes 2. I was tempted to put this little horror show by the front door to greet all the little sugar bees. Pinewoods have a distinctive flora, and when I was a kid I lived near a block of remnant pine growth. There I got to know some of the distinctive plants which grew there. When we moved to the present home in 1961, I found myself surrounded by a new flora. Sadly, many of the plants once common here are now rare or gone - I blame the deer and the wildflower vandals. But some of the disappearances are due to a different cause, the natural ageing out of a once dominant flora. Within easy walking distance of the house there is a patch of remnant pine growth. I've been visiting this spot for over a half century, if only for the memories it recalls. Only a few of the pines themselves survive, and under them a few of the plants characteristic of pine woods. Here you see two of them: the partridge berry, Mitchella repens and one of the pipsissewas, Chimaphila maculata. The partridge berry seems to be taking the changes in stride; the pipsissewa not so much so. That's not surprising: for success, the partridge berry mostly needs lack of competition from taller plants. The pipsissewa on the other hand evidently lives in association with soil fungi which themselves form relationships with the pines. When the soil fungi go, so too will the pipsissewas. By then, I'll probably be gone, too. It was probably fifty years ago when I first read Konrad Lorenz's King Solomon's Ring. The image above provoked a memory of one of the stories in the book. It seems that the Lorenz residence included many of the animals curious zoologists tend to accumulate, including graylag geese. The geese had the run of the ground floor of the house, and their deposits littered the floor. Lorenz's grandfather, whose vision was failing, had frequent, unsanitary encounters with these. So when I first saw what you see in the image above, it was easy to imagine that a flock of thousands of well-fed geese had recently roosted on those ball fields. But geese are not to blame. An aerator had recently worked the fields, and the results when wet will be just as messy as what geese leave. When I stepped out onto the front porch the other day, I saw this draped over the front steps. It's a black rat snake, our largest local snake. But it's probably not just any black rat snake. It's probably "our" black rat snake. And if it is, it has been seen here over and over since it was a hatchling. It and"our" garter snakes can be seen in the bushes along the front of the house in April and in October. They bask in the bushes, and I'm pretty sure they hibernate at the house foundation. I've long regarded the presence of snakes as proof of a well managed garden. While absentmindedly staring out the bedroom window the other day, this bit of gorgeous blue caught my eye. It was only about eight feet away, out on the deck eating grass seeds. I walked to the other end of the house to get a better view, and just then I heard the front door opening: Wayne was coming in. I grabbed him by the arm and motioned for him to keep quiet as I whispered "indigo bunting" and dragged him to a window with a good view. I gave him the camera and he took the video you see here. Vermeer and Van Leeuwenhoek: best buds pranking and pulling a fast one? Yesterday Wayne and I went down to the National Gallery to see the exhibit VERMEER AND THE MASTERS OF GENRE PAINTING. It was time well and enjoyably spent. Dogs of a brown and white spaniel sort appear in several of the pictures, and we heard someone joking that the several painters all used the same dog, borrowing it one after another. This morning's Washington Post had an article on two breeds of dog now newly recognized by the American Kennel Club: one is the nederlandse kooikerhondje, a brown and white spaniel which looks just like the dogs in the mid-seventeenth century paintings. I was about to write a letter to the Post pointing out that the dogs in the Post picture looked a lot like the dogs in the paintings. When I pointed this out to my friend Jane, she responded that the Post did mention (in the later edition she read) that the dogs sometimes appeared in old paintings: in other words, as she put it, someone beat me to it. There were also parrots in some of the paintings. The first one I spotted, from a distance, looked like an African Gray Parrot to me. But on closer inspection, it appeared to be green. Is this a case of an originally gray pigment ageing to green? As I looked at that face this morning, I had a bit of startling insight - or was it delusion? To me that face was familiar. And it was something I saw in the exhibit yesterday which seemed to bring several things together. The exhibit included the famous paintings The Astronomer and The Geographer. There is a tradition that A. Van Leeuwenhoek was the model for the men portrayed in these paintings. Not a lot seems to be known about the connection between Van Leeuwenhoek and Vermeer, but this much is known: the records of their births appear on the same page of the registry in the Delft church where these were recorded. And Van Leeuwenhoek was the executor of Vermeer's will. Girl with the Red Hat is a bit of a puzzle. The subject of the painting is wearing an outlandish get up: there is no reason to believe that the citizens of Delft went around dressed that way. That pretty much rules out its genesis as a portrait. Nor is it a typical genre piece. The painting seems not to emphasize the quality of the garments so much as it obviously gives the artist the opportunity to display some exquisite brush work. And what is that hat made of? But what really catches the eye is that beautifully rendered face. No female face in the exhibit comes close to this one: it's so natural, so warm and alive, so real. And when I look at that face I see the same face looking out from the painting of The Geographer, the face, it seems to me, of a young, comely Van Leeuwenhoek. Were Vermeer and Van Leeuwenhoek best buds? Are they pranking here and trying to pull off a fast one on us? You've got until January 21 to get down to the museum and see all three paintings for yourself. The Astronomer and the The Geographer are in the big exhibit, Girl with the Red Hat is in Gallery 50A. And is this the first time all three have been under the same roof at the same time since they left Vermeer's studio? My bedtime reading last night was from Richardson Wright's 1933 Another Gardener's Bed-Book. In the opening chapter he notes that the sum of the pieces he had by then written in his two Bed-Books was 730. Each of his Bed-Books contains 365 pieces, one for each day of the year. This blog is not written on a daily basis; lately I've been lucky to do a couple of entries per month. But here's what prompted me to make this blog entry: I've now made over 730 blog posts since I started back in 2007! And while it took a lot longer for me to reach this point, at least I'm still at it. 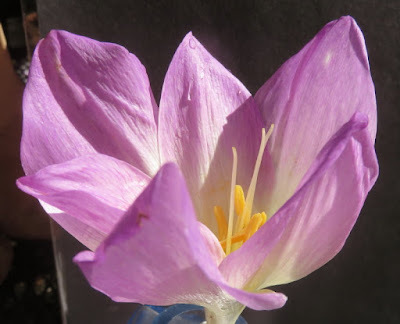 Colchicum 'Rosy Dawn' a massive but untessellated cultivar. 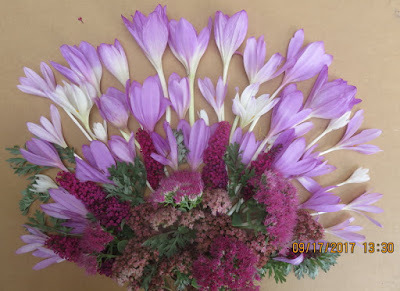 The two images here show the difference between tessellated and untessellated flowers in colchicums. In the image of 'Beaconsfield' you can easily see the checkerboard pattern of the color. The intensity and clarity of this pattern varies with the age of the blossom and the light conditions. In addition to 'Beaconsfield', other cultivars which show this pattern well are 'Disraeli' 'The Giant' and 'Glory of Heemstede'. In 'Glory of Heemstede' the pattern is somewhat smudged but the overall color is very good. In 'The Giant', overall the color is pale and so the tessellation is not distinct unless the blossom is examined closely. For contrast, the lower image shows 'Rosy Dawn', an untessellated variety. Note the lack of the checkerboard color pattern. Grow this cultivar for its massive blooms: the outer tepals are more than an inch wide in well grown examples. I suspect that only those with a high tolerance for nomenclatural instability will persist long in an enthusiasm for the wild forms of the genus Colchicum. This uncertainty extends to the garden hybrids, too. Above you see six of these hybrids, six very well worth having. Some of the names date back to the pre-WWI hybridizing work of the Zocher firm. Whatever they are, they are wonderful. The enthusiasm for these plants when they were introduced and the sometimes hyperbolic naming might seem excessive to us, but keep in mind that a century ago, the only colchicums likely to be seen in European gardens were forms of the diminutive European wildflower Colchicum autumnale and the ancient Colchicum byzantinum, aka Colchicum autumnale major . In comparison to those pale little ones, these big, richly colored and sometimes tessellated hybrids are glorious, wondrous giants indeed. In the image above you see, left to right, 'Rosy Dawn', 'Glory of Heemstede; 'Beaconsfield', 'Jochem Hof', 'The Giant' and 'Disraeli'. 'Glory of Heemstede', 'Beaconsfield', 'The Giant' and 'Disraeli' are all characterized by conspicuous tessellation. 'Jochem Hof' is notable for its intense, dark coloration. 'Rosy Dawn' is remarkable for the width of the tepals: some are over an inch wide! Last night Wayne and I went for pizza. There are several top-notch pizza places within a five or ten minute drive from here, and last night we tried PizzaCS again. CS in this case stands for the Italian come sempre meaning “as always”, an allusion to their membership in the Associazione Pizzaiuoli Napoletani. If there are such people as pizza geeks, this is probably where they dine. There’s nothing fancy about this place, but you can get a pizza made with mozzarella di bufala and the crusts are wonderful. My choice was pizza Margherita, and as I munched it I absentmindedly made one of those connections that I should have made long ago. Have you ever wondered who the eponymous Margherita was? She was none other than Margherita Di Savoia, Queen of Italy at the end of the nineteenth century. About forty years ago, with little more with me than a Eurail Pass, a camera, some cash and seemingly unlimited optimism and enthusiasm, I spent six weeks in England and western Europe. While in England, the “vegetarian hostel” in which I stayed (it had an opium poppy growing in the cracks of the front steps – I’ve got a photo to keep the memory keen) had a beat-up old upright piano in the basement. Out of curiosity, I opened the piano bench and there I struck gold: volume I of Parisotti’s 1885 Arie Antiche. My offer to purchase it was declined: "You can have it" was the proprietor/manager's response. Two pages from this are shown here, including the page dedicating the work to Margherita Di Savoia, Regina D’Italia. This book might carry even more history: written inside the cover is this: “June Forbes-Sempill, München 1939”. Is this the Hon. June Mary Forbes-Sempill, daughter of William Francis Forbes-Sempill, 19th Lord Sempill? Was she one of the many aristocratic young English women sent by pro-German families to Germany in the 1930s for finishing? If so, her death in 1941 at age 18, "killed by enemy action", was ironic (from thepeerage.com). Her father, Lord Sempill, was a notorious British spy employed by the Japanese. He was so well connected that he never faced charges for his traitorous activities. Here are some late blooming Hemerocallis combined with others plants also blooming now. The smaller yellow daylilies are 'Autumn Prince', the larger orange ones are 'Autumn King'. Mixed with them are some hardy ageratum, Tatarian aster, a lone bellflower, common bindweed, Salvia guaranitica and several sedums. I've grown to like these tall, lanky Sinningia. So far, the best way to use them in the garden has eluded me. 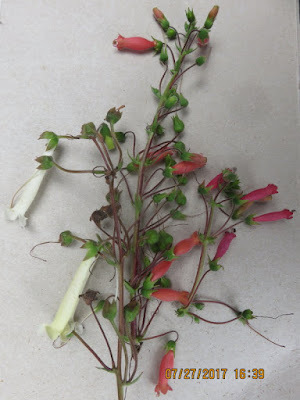 They remind me of salvias, penstemons and even Phygelius. The three you see here, left to right, are 'Butter and Cream', Sinningia sellovii and 'Scarlett O'Hara'. There are others, and I'm beginning to think I want them all. They have yet to be tested by a winter in the garden; I know from experience that when dry they survive easily in a cold frame, but in recent years it's been easier to keep them dry in zip lock plastic bags at room temperature. The light green growths you see in this image are this year’s new growth on Smilax laurifolia. It’s making lots of strong new growth this year, and as you can see in the image it’s having its way with the crepe myrtle. The area caught in this image is at about the 12'-15' level. Were you to look at the top of the crepe myrtle, you would see the topmost strands of the vine waving in the breeze. It has just about reached the size where I’ll be comfortable cutting it for house decoration. 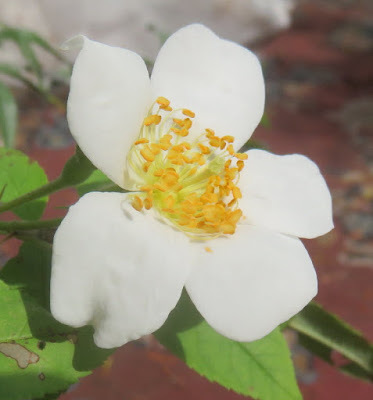 Rosa moschata “Graham Stewart Thomas”: note the formatting of the name. This is not a formally named cultivar, thus the use of double quotes rather than single quotes. 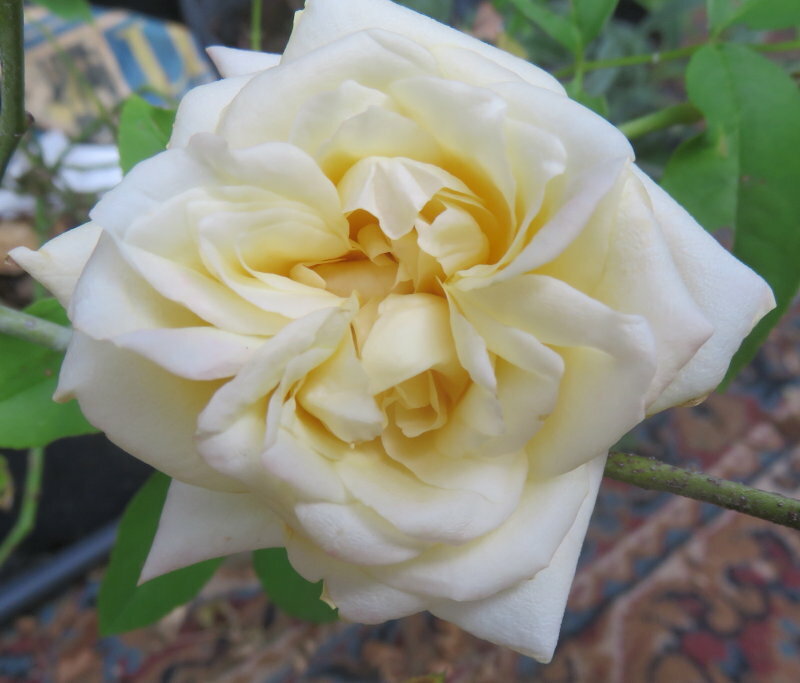 This, the least prepossessing rose in the garden, has the most impressive provenance of any rose I have ever grown. Canon Henry Nicholson Ellacombe (1822-1916) Rector of Bitton, Gloucestershire, late nineteenth-century author of garden books and mentor of Edward Augustus Bowles, grew this rose at his home Bitton in Gloucestershire. Bowles acquired a piece of it from Ellacombe and grew it at Myddelton House. Graham Stewart Thomas found the Myddelton House plant in its senescence and rescued a piece. The plant I have in my garden now over a century later is a piece of the plant Graham Stewart Thomas distributed, the plant grown by Bowles and Ellacombe before him. They don’t come any better connected than that! Here’s another Bowles connection: here you see a flower of this rose on a page from the Elizabethan, 1597, edition of Gerard’s Herball. This volume was once owned by Bowles, as is shown by marginalia in his hand seen elsewhere in the book. Here’s something new and exciting for our gardens. Lilium ‘Fusion’ is said to be a hybrid of Lilium longiflorum and one of the lilies native to the west coast of North America, probably Lilium pardalinum. 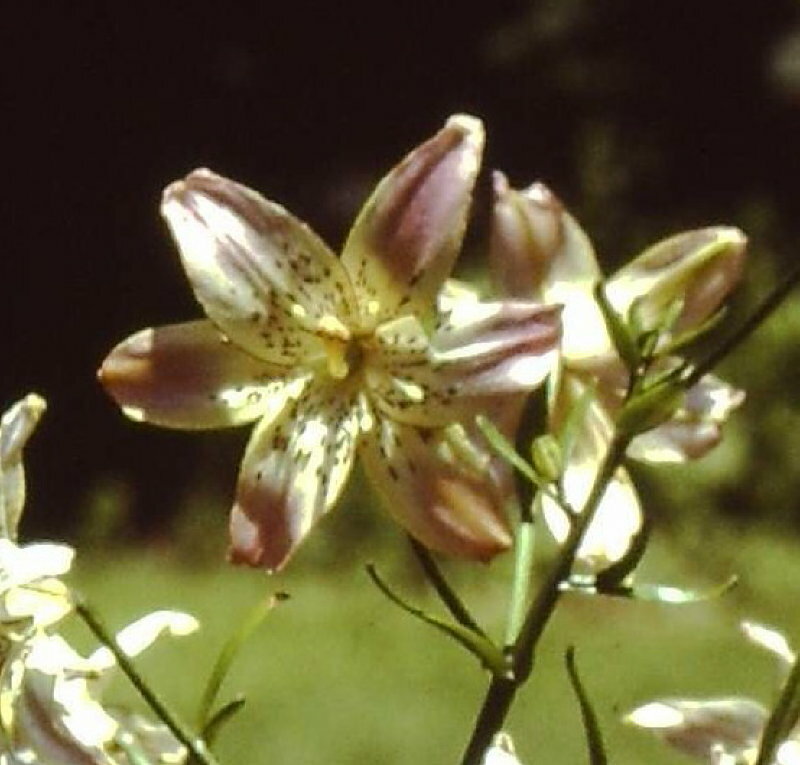 During the first half of the twentieth century, as long as Carl Purdy and his native American collectors continued to supply wild collected bulbs, these western American lilies were evidently common in eastern American and British gardens. Competing with these wild-collected bulbs were the imposing Bellingham hybrids raised, and distributed, by the thousands by David Griffiths. Do any of these survive today? The flowers of ‘Fusion’ are zygomorphic, something seen in some lilies of the martagon group and in some Cardiocrinum. The foliage is scattered on the stem, not whorled. Let’s hope it turns out to be a good garden plant in our area. Two or three years ago, while visiting his mother in Bridgewater, Virginia, Wayne and I saw a group of what seemed to be dwarf cleome in a local garden. A seed grown strain of dwarf cleome had just been introduced under the name ‘Sparkler’, and that might have been what those plants were. ‘Sparkler’ seed is expensive, and I’ve been waiting for the price to come down. While plant shopping early this year I spotted plants from Proven Winners under the name ‘Señorita Rosalita’ and decided to give them a try. They were planted in big tubs in mid-May, and by now they have formed very handsome bushel basket sized masses of bloom. If they keep this up all summer, they’ll get my vote as one of the really important new annuals for our gardens. And they don’t form seeds so there will not be a cleome invasion to deal with next year. This little plant comes from southeast Madagascar and is another long term survivor here. Decades ago I briefly belonged to the local cactus and succulent club. At one of their plant exchanges I selected this plant. It had been contributed by none other than Harry Dewey, one of my much admired predecessors as editor of the local rock garden bulletin. Is this the first time it has bloomed here? 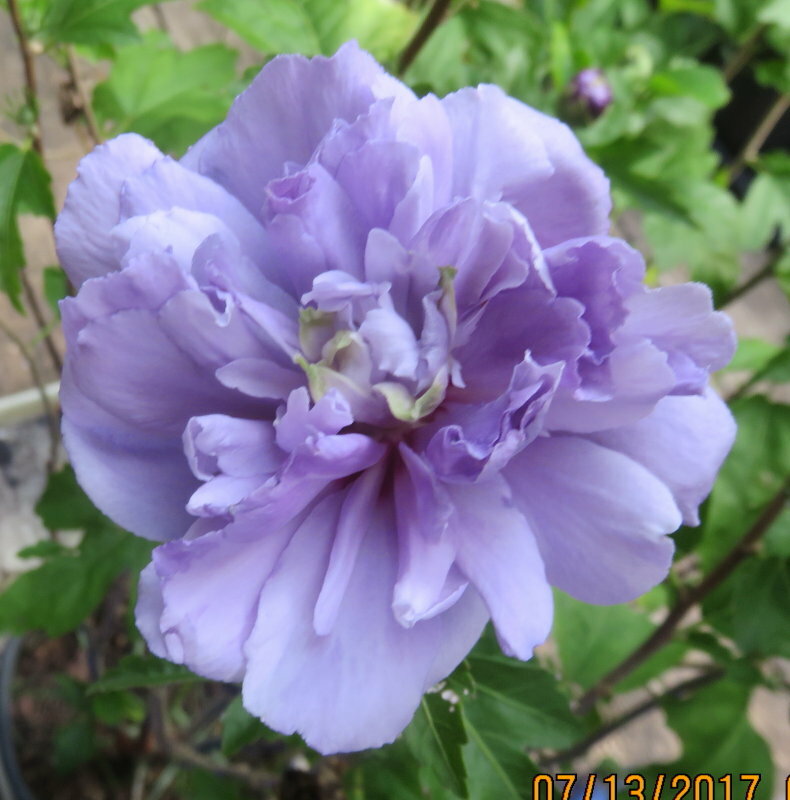 I’m not sure, but if it bloomed in the past I did not notice. I would like to take a lot of credit for this attractive combination, but the credit goes to the protean fecundity of that mother of invention, necessity. I had bought the Calathea on impulse and needed a place for it. It would look great in the house but almost surely die quickly. A shady place outside seemed like a good idea, but exactly which shady place? So I decided to put it out on the deck, and noticing the free space between the two coleus, popped it into that space. Then I took a second look and realized "Wow, that really works!" The Calathea came unlabeled, but a quick search of Google images led me to the name used above. Nomenclature note: most of the plants once known as Coleus , after banishment to Solenostemon in the late twentieth century, are now placed in Plectranthus. A half century ago Ernst Mayr provided a very plausible species concept. But no one has ever done the same for genera, and I gave up "believing" in genera decades ago. I treat them as opinions, some well-founded, some not so much so. Lilium 'Corsage' back from the brink! 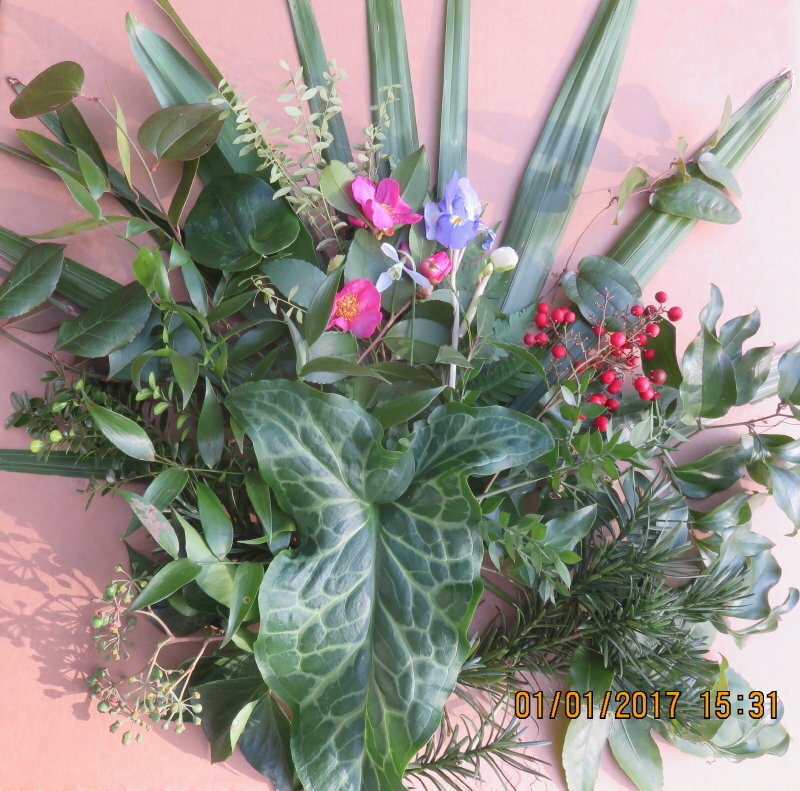 I was growing lilies for nearly twenty years before I took an interest in what was going on in the greater lily world - the organizations, the hybridists, the commercial suppliers of hybrid lilies and so on. I became aware of hybrid lilies from two main sources: the catalog of Blackthorne Gardens and the catalog of the Peter de Jager company. The de Jager catalog back in the 1960s had pages of beautiful, full-color modern photographs of the de Graaff hybrids, among them photos of the one you see above, 'Corsage'. One of the images you see above is a scan done this morning of a Kodachrome slide made in 1979, the other is a digital photo taken this morning. No lily from back in those days still survives in my garden. Few lilies from back in those days survive in commerce. When lily stocks became infected with virus back in those days, we assumed that was the end for them - forever. Then we learned about the possibilities of meristem culture, and that stocks could be cleaned up to some extent. But by then much seems to have been lost, and one after another, favorite lilies became commercially extinct. When I lost my home-grown stocks of 'Corsage', I never expected to see it again. But it's back! I have not heard the background story yet, but there it was in the late winter catalogs of 2017. And now it's blooming again in my garden, nearly forty years after that Kodachrome slide was taken. Has it really been almost two months since the last blog post? And it's not because of a lack of noteworthy events. Yikes, time is flying. I'll try to get some catch up going today. 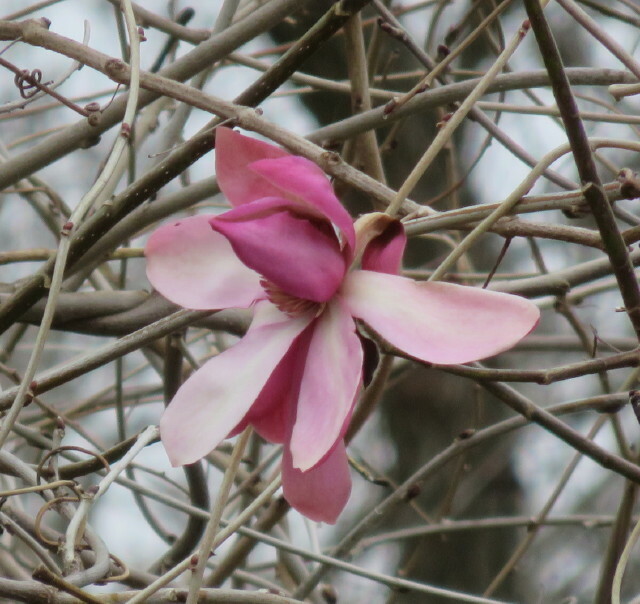 Spring began here on February 23; the criterion which determines this for me is the calling of the first peepers. Wayne heard them on that date down in the nearby KenGar wetlands. But they have not been calling much since then, although there was a two day period when peepers, upland chorus frogs and wood frogs could all be heard together. We'll probably be in the deep freeze for the rest of this week, so the next peeper choruses are at least a week off. Iris cretensis : hard to believe that something this beautiful blooms now! Winter has yet to take a deep bite out of the garden, but even so many plants which would ordinarily be pushing up against much stiffer weather are holding back this year. The first of the lawn snowdrops are up, and the clone selected here and called 'Christmas' is in full bloom - finally, because it was late for Christmas. The snowdrop I call 'Thanksgiving' was also late this year. Two different acquisitions of the one spot forms of Galanthus elwesii are now in full bloom. The first flowers of Jasminum nudiflorum opened today, and yesterday I saw flowers opening on Hamamelis 'Jelena' and Lonicera fragrantissima. Little Narcissus cantabricus has a tiny bloom mostly open and resting on the mulch surface. So things are happening. But we really have not had winter yet, so who's to say what's ahead? When I checked the cold frames today there was a nice surprise waiting. That's Iris cretensis you see above. Its flowers are bigger than those of any reticulate iris, but they are smaller than those of Iris unguicularis. I had to wait for the generous flowering shown above: like Iris unguicularis, this one takes its time (as in a year or two) to settle in and bloom freely. But it's worth the wait, isn't it? I would rather be posting an image of this plant in bloom, but I have a hunch it will never bloom here. Or at least it will not bloom here until I can provide it with more space and more light. I naively thought it might be possible to grow it in a cold frame. Now that I've seen just how big it is, it's obvious that it will not fit into any cold frame I have here. So it's being grown as a house plant (some might want to add "when it should be grown as a greenhouse plant"). As it turns out, it's a very handsome foliage plant - at least it is in the early stages of its vegetative growth. That's Biscuit, our twelve pound ShihTzu, reluctantly providing scale in one of the images. A sighting of these striking birds, the largest woodpeckers likely to be seen in North America, should make the day for most casual birders. I've been fortunate to live in pileated habitat for over a half century, and I see these birds frequently (and hear them!). And it's still always a thrill. Wayne photographed this pair in the Waverly-Schuylkill Park only two blocks down the hill from our house.